Located in East Perth, Fraser Suites Perth is in the business district, within a 15-minute walk of WACA and Perth Mint. 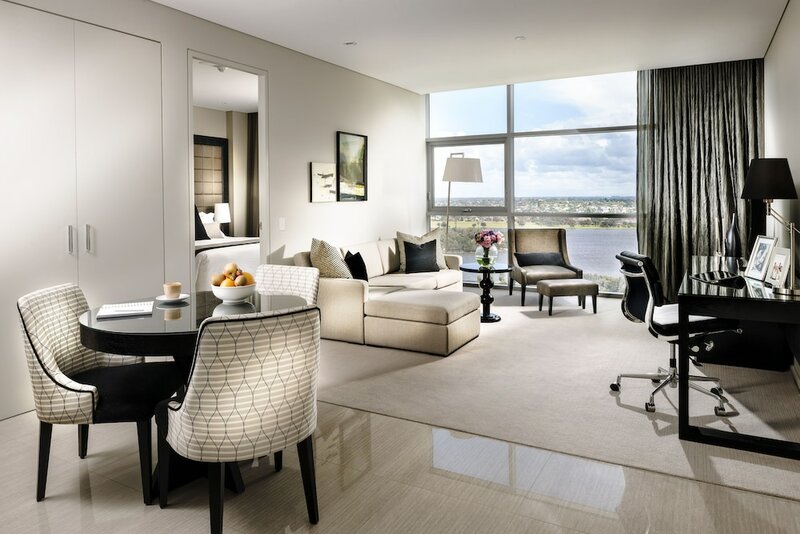 This 5-star aparthotel is 2.3 mi (3.7 km) from Kings Park War Memorial and 2.5 mi (4 km) from Optus Stadium. Make yourself at home in one of the 236 air-conditioned rooms featuring microwaves and iPod docking stations. Wired and wireless Internet access is complimentary, while 40-inch LCD televisions with satellite programming provide entertainment. Bathrooms have designer toiletries and hair dryers. Conveniences include phones, as well as safes and desks. Be sure to enjoy recreational amenities, including an indoor pool, a sauna, and a 24-hour fitness center. This aparthotel also features complimentary wireless Internet access, concierge services, and babysitting/childcare (surcharge). Enjoy a meal at the restaurant, or stay in and take advantage of the aparthotel's 24-hour room service. Wrap up your day with a drink at the bar/lounge. Buffet breakfasts are available daily for a fee. Featured amenities include limo/town car service, a computer station, and complimentary newspapers in the lobby. Self parking (subject to charges) is available onsite. In addition to an indoor pool, Fraser Suites Perth provides a sauna and a 24-hour fitness center. The aparthotel offers a restaurant. A bar/lounge is on site where guests can unwind with a drink. A computer station is located on site and wireless Internet access is complimentary. This luxury aparthotel also offers spa services, a terrace, and tour/ticket assistance. Limited onsite parking is available on a first-come, first-served basis (surcharge). Fraser Suites Perth is a smoke-free property. Fraser Suites Perth has a restaurant on site. Recreational amenities at the aparthotel include an indoor pool, a sauna, and a 24-hour fitness center. This property's policy is to refuse certain bookings for the purpose of group events or parties, including pre-wedding stag/bachelor and hen/bachelorette parties. The property has connecting/adjoining rooms, which are subject to availability and can be requested by contacting the property using the number on the booking confirmation. Parking height restrictions apply.